Description: as is usual for Stegosaurs, the most noticeable thing about this creature is the double row of plates running from its neck to halfway over the tail. In total, this sculpt carries 22 plates (one of them on the dino damage piece), all varying in size. Additionally, at the end of its tail there are the four spikes Stegosaurus uses to defend itself with. These spikes are also the main ingredient of the action feature this sculpt is equipped with. Pressing the two back plates behind the dino damage piece together causes the tail to swing around, giving this beast the opportunity to knock figures down. This mechanism works fairly well, though it gets damaged easily. This animal's dino damage piece is located right above the right front leg: removing this piece reveals white ribs, a shoulder bone and red muscle tissue. The Stegosaurus assumes a sort of walking posture, its left hind leg in a forward move and its right hind leg moved backward. Its front legs are neutrally positioned though. His head is posed to the right, as if the animal is looking down at something. Green is the predominant colour of this figure’s paint job. The entire upper part of its body (upper part of the tail, back, neck, top part of the hind legs, upper part of the head) is painted dark green, including all the plates, though the larger ones on its back (not on its tail, since the figure’s tail section is composed of a different material to facilitate the attack action) are toned even darker green. The creature’s flanks, sides of the tail and head and most of the legs sport a much lighter shade of green, while its underside (belly, throat, lower jaw, lower part of the tail, inner part of the legs) is coloured bright beige. The spikes on the end of the tail are painted dark green at the base, which gradually changes into beige too. The Stegosaurus has very small yellow eyes (with black pupils and white irises), and a black JP logo on its lower right hind leg. The small claws on its elephant like legs are not painted in a different colour. This figure comes with four pieces of capture gear, which can be assembled together to form a hind leg and tail restraint. It basically shackles the legs, which via a wire are connected to what can best be described as a box that goes around the tail, keeping the animal from using its spikes. This also makes the tail attack option a dinosaur-breaks-free-of-capture-gear action: pressing the plates together makes the Stegosaurus whip its tail, break free of the box and smash it in two. It doesn’t get rid of the shackles though. All pieces of capture gear sport the same shiny silver metallic paint job. The Dino Hunter stands in a largely neutral pose, except for his right leg which is moved slightly forwards. He sports an almost military outfit, namely a light blue shirt with a black vest and dark blue straps over it, as well as light brown gloves, dark blue pants with light blue stripes in an asymmetrical pattern suggesting camouflage on them, and black boots. He also has a pair of black sunglasses on. He has a stone cold facial expression and brown Elvis like hair. He’s got some detailing on his pants, though it’s hardly noticeable because it’s coloured in the same blue as the pants themselves: on his left leg he’s got one pocket, while on his right leg he has a knife as well as some damage to his pants, indicating he’s had a close call with a hungry carnivore. Analysis: the only other larger dinosaur figure of the first JP: Dinosaurs line is brought to you from the TLWS1 line instead of the original JP toy line. It's the Stegosaurus, and boy, did they do little with this figure! The sculpt itself remains unchanged, which is for the best compared to the Tyrannosaurus JPD1 brings us, which was recast so badly it had no action features to speak off left. 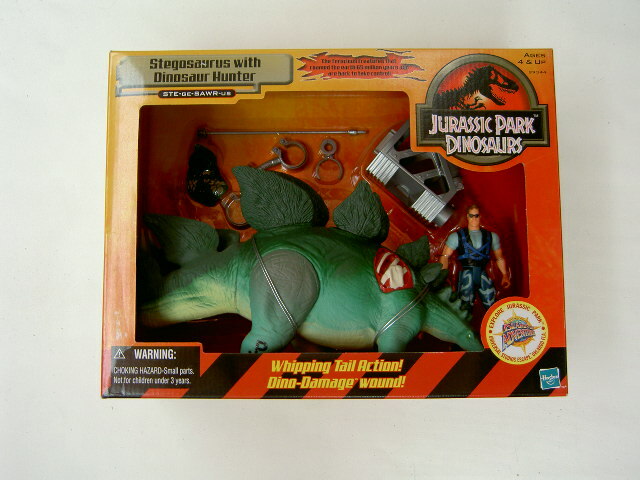 Stegosaurus fares better in this regard: both the whipping tail action and Dino-Damage (Trade Marked, according to the box) wound work as well as they did before (which in the latter's case means it keeps falling off on its own accord). The paint job is very similar to the one seen before, but with different hues of green being used. Unfortunately, the green we had was fine, while these other greens are kinda ugly together. It also lacks painted details, like the big nails on its feet and such, but this is of course common for this line (though at least the T-Rex got more than its fair share of detailing). It would have been nice to see a Stegosaurus coloured something other than green for a change (this is the third time in a row! ), but apparently the toy designers can't come up with different colour schemes for this species. A shame, but not a loss we can't overcome. The animal comes with the same capture gear as before, which still does what it's supposed to do: either contain the animal's tail or be destroyed by it, your choice. Repaint: yes. This is a repaint of the TLWS1 Stegosaurus figure, with repainted dino damage and the same capture gear as its TLW predecessor. The Dinosaur Hunter is a TLWS2 Ajay repaint, with a repainted head sculpt from TLWS1 Peter Ludlow. Both figures would not be repainted again. Overall rating: 6/10. This Stegosaur's paint job is not as appealing as before, but not a complete atrocity either, and it's still a very nice sculpt regardless. The same thing basically goes for the Dino Hunter, though it's a shame he doesn't come with any weaponry like the other human figures of this line. This set is not the easiest find of this toy line, especially in MIB or complete condition. It could take quite some time to track it down, plus a decent amount of money to get your hands on it.